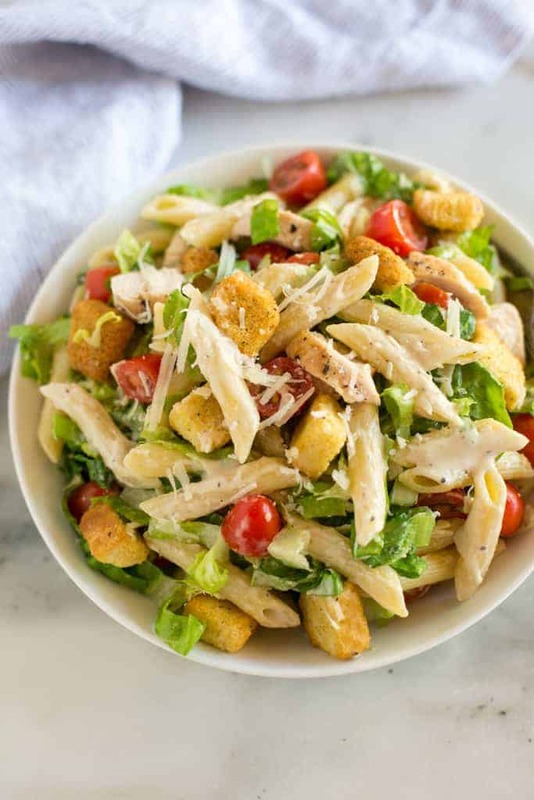 This Chicken Caesar Pasta Salad is loaded with all of the traditional toppings for a caesar salad, including croutons, parmesan cheese, lettuce and tomatoes, with added pasta and chicken, all smothered in a creamy caesar dressing. Serve this cold pasta salad as a side for your next bbq or as an easy weeknight dinner. There is something completely refreshing about this caesar pasta salad. I love the crunch from the romaine and croutons and the flavors of the creamy pasta, grilled chicken and parmesan cheese. You can make homemade caesar dressing for the pasta salad, or buy a good quality creamy caesar dressing from the store. I like Newman’s Own or Brianna’s brand. I love adding chicken to my pasta salad recipes because it’s an easy way to add protein and make them more filling, which is great if I plan on serving them as a main dish. 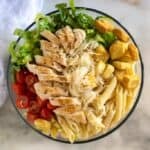 Some of my favorite main dish pasta salad recipes with chicken include this healthy chicken pasta salad with a creamy citrus dressing, and this spinach chicken bowtie pasta salad with teriyaki dressing. No one loves a good pasta salad as much as my kids! I constantly keep cooked noodles in my fridge just for the convenience of throwing together a quick lunch of one of their many favorite pasta salads. Start by cooking the noodles in boiling water until al dente, according the package instructions. Drain the water and rinse the noodles with cold water. 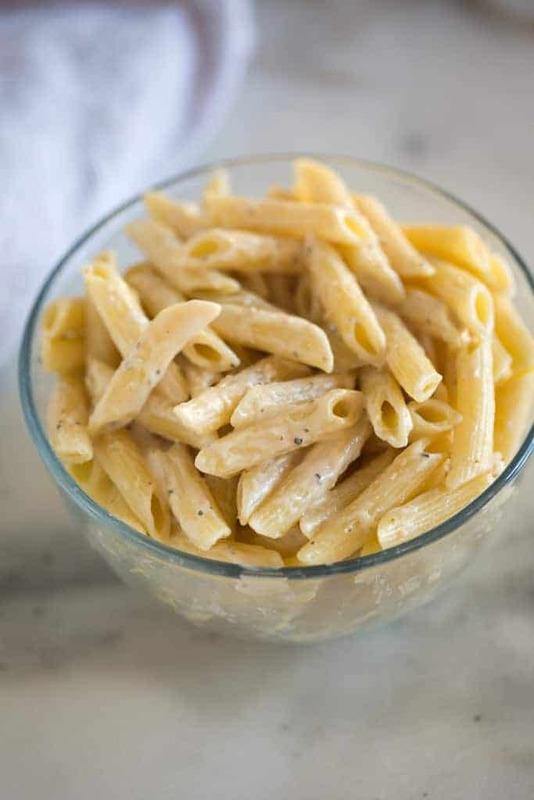 Drizzle some caesar salad dressing over the cooked pasta and refrigerate it while you prepare the rest of the pasta salad. Season the chicken on all sides with salt, pepper and a little garlic powder. Cook in a hot skillet, flipping only once, until golden on both sides and cooked through. Remove the chicken to a cutting board and allow it to rest before chopping. Combine the pasta, chicken, chopped lettuce, tomatoes, croutons and shredded parmesan in a bowl. Add desired amount of caesar dressing on top and toss everything gently to evenly coat in the dressing. 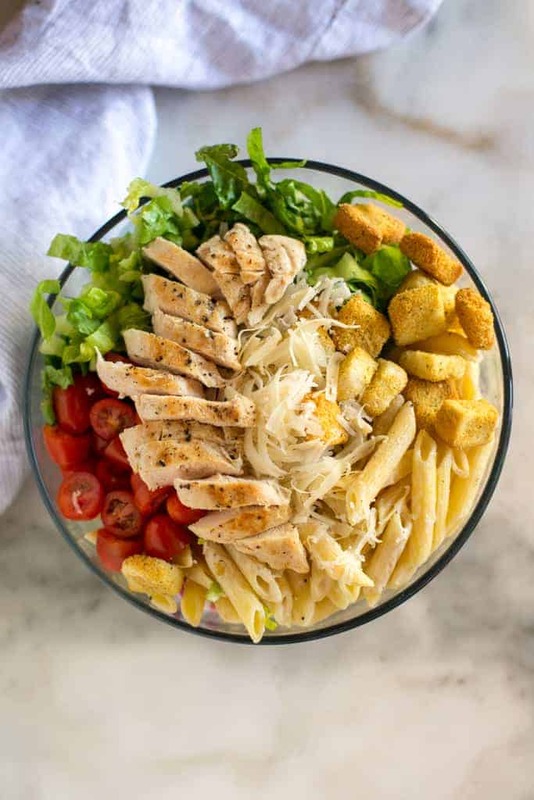 Chicken Caesar Pasta Salad loaded with all of the traditional toppings for a caesar salad, including croutons, parmesan cheese, lettuce and tomatoes, with added pasta and chicken, all smothered in a creamy caesar dressing. The perfect easy weeknight meal, or side dish for a BBQ. Cook pasta according to package directions. Drain water and set aside to cool. Chop the grilled chicken breasts into small chunks. In a large bowl toss together chicken, cooked penne pasta, lettuce, cucumber, carrot, green onion, cherry tomatoes, Parmesan cheese and croutons. Drizzle with desired amount of Caesar salad dressing and toss to coat. *I originally shared this recipe May 2014. Updated June 2018. This is absolutely something my family would eat! Pinning! My family gobbles it up! Hope you like it 🙂 Happy Memorial Day weekend! Wow, this looks DELICIOUS! In fact.. I wish I had some for lunch today! Thanks for the great recipe. Pinning! Mmm! This looks so good! My husband would love this too. Thanks! Thanks Becky! My husband is a huge fan of this one! Love this recipe. I am sooo NOT a good cook, but all 4 of my kids have requested that I make this again! Wooohoooo! Thanks again! What caesar dressing do you prefer? I haven’t found one that I’ve really liked yet. Hi Beki, I love to make mine from scratch (I’ll post the recipe soon)!. Otherwise I like Girard’s light caesar. Hope you like the salad! Love this salad! It has some of everything. Would the lettuce get soggy if we had leftovers for lunch the next day? This is so delicious and easy! Even my kids loved it! Thank you!